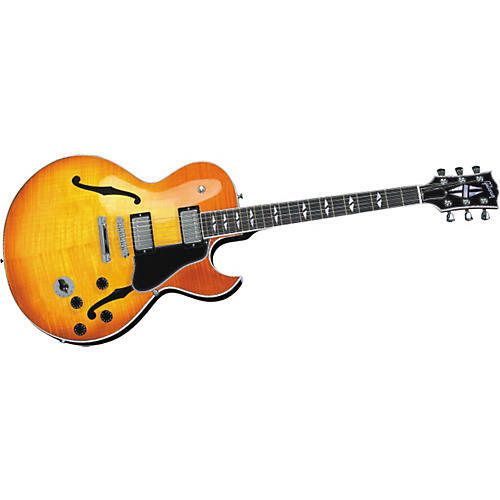 Based on the ES-137 Classic, the Gibson ES-137 Custom Electric Guitar is the first Gibson archtop to employ a mahogany center block for reduced feedback and greater sustain. Other features are all Gibson deluxe: laminated curly maple body, binding on top and bottom, bound fingerboard, bound peghead, ebony fingerboard, gold hardware, split-diamond overlay headstock, pearloid split-diamond fingerboard inlays, 6-way Varitone switch that filters tone from fat to thin, and '57 Classic pickups (the original Gibson humbuckers from 1957). The magnets and 42-gauge enamel-coated wire are from the original suppliers and the pickups are built by Gibson on the original machinery.